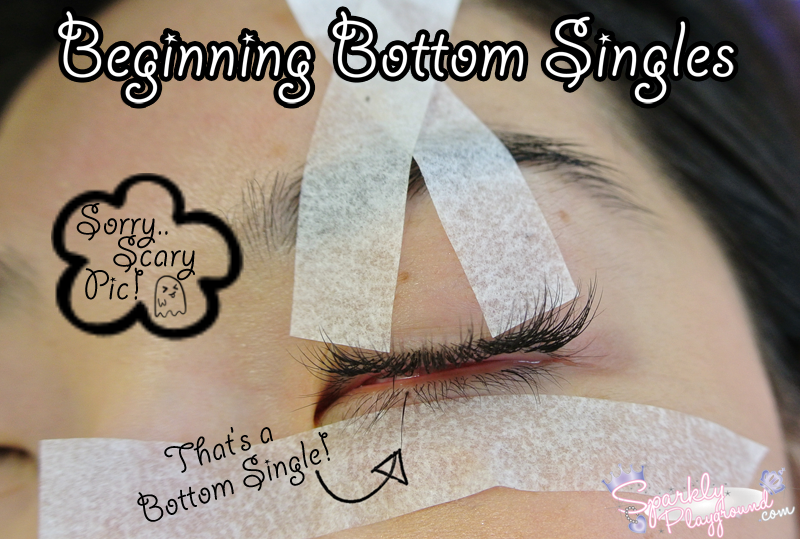 In this post, I will be documenting my FIRST Eyelash Extensions EVER! I learned a lot through the process so I wanted to share with you too! I was invited by Eyelash Canada to experience one of their many services - eyelash extensions. I read their website so many times to familiarize myself with eyelash extensions in general because I'm skeptical about my eyes. YOU ONLY HAVE ONE PAIR! Here's a look at my before photos. I have been told before that I have pretty decent lashes for an Asian. They are longer than most Asian girls but because of my mono-lids, half the length of my lashes are covered by my lids. To be honest, I rarely take photos without false lashes because I'm SUPER insecure about my natural eyelashes! I wore glasses to the appointment and had zero eye make up. I had minimal face make up but I avoided my eye area entirely! I also avoided the use of eye skin care before that morning to avoid oils as much as possible. Researching about the procedure is also great just so you know what you're expecting! Here's a shot of some of the equipment they have for the procedure. I've learned that all the equipment used on me are sanitized and disinfected overnight so it's 100% clean. Yvette shared stories about how she knows of other business who uses the same set of tools with several clients in a day! 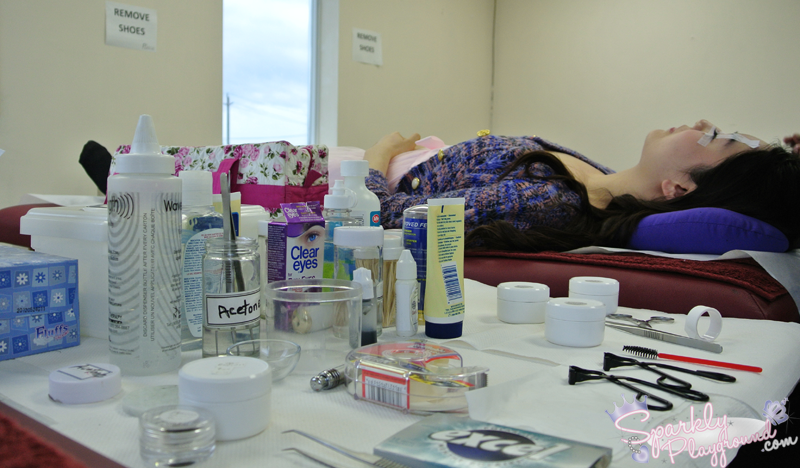 *yikes* At Eyelash Canada, a new and sanitized set of tools are used on each client. Yvette did a brief consultation with me and decided that I'm suited for lash length of 8 to 12mm and will be applying B and J curve lashes on me. It's going to be a natural, fuller look and taking consideration that I'm a eyeglass wearer. In this experience I will be doing Singles and Bottom Singles eyelash extensions. 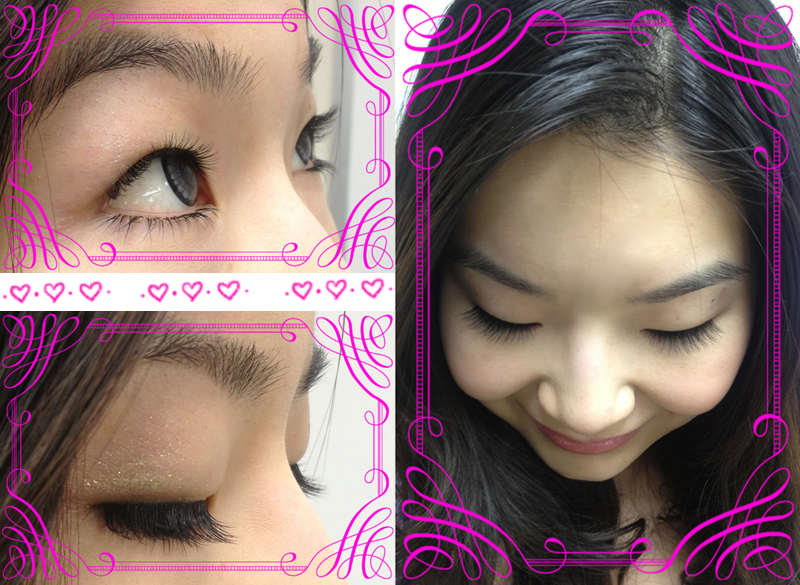 Single Strand Eyelash Extensions are applied one by one to your own natural lashes. As you can see from the above photo, Yvette separate my natural lashes with a tweezer and glued a lash to my own lash. It's some crazy skill with eye and hand coordination! 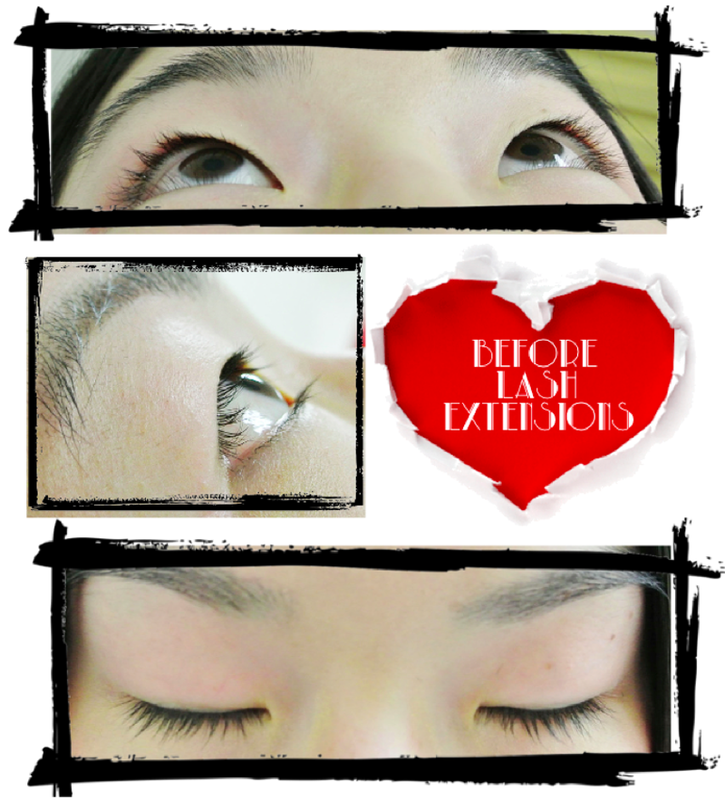 Don't forget, the technician also need to make sure that the curve of the lash is not going in all sorts of direction. Getting a little side-tracked here, these are what Yvette calls "binoculars" LOL! I should've tried these on! 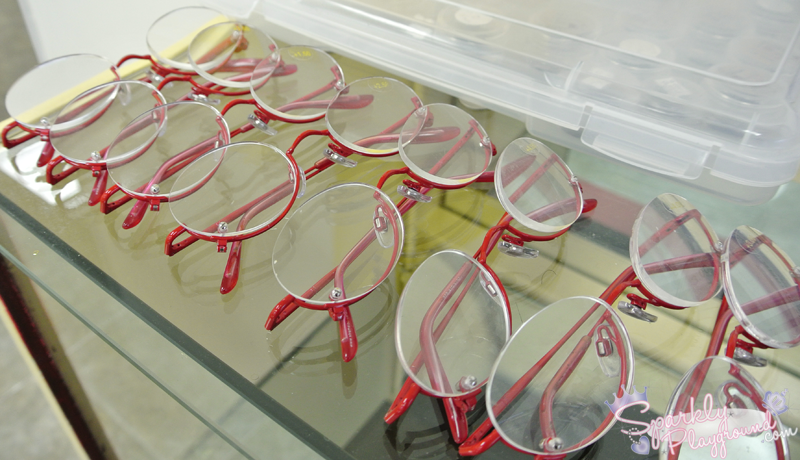 There are the glasses technicians wear because of the tremendous eye strains from working on eyelash extensions. Can you imagine staring at your eyelashes for 1.5 hours straight?!?! 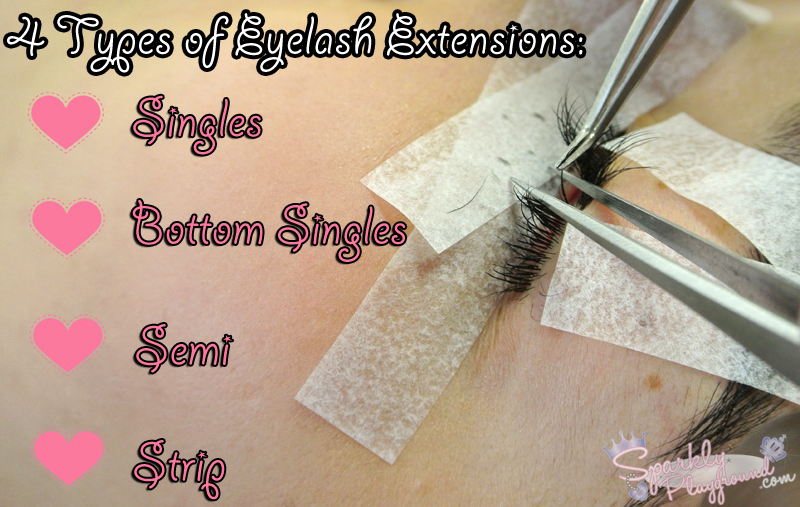 Generally, Single Strand Eyelash Extension is the most natural type out of the 4 types. If you take proper care, the extensions can last for a full cycle of your eyelash growth - average cycle is 45-90 days. Yes, our natural lashes do fall out, but we grow new ones :) If you're thinking, wow, so half way through, my lashes are going to look awkward! That's True! It will eventually look not as good as you first get them done, very similar to gel/acrylics/gel polish nails, so you go for refills or repairs. This gets quite addicting! haha! Within the Singles type, you can still pick what kind of material your lash extensions will be: synthetic (most common and the ones I have on), mink and silk. So far I think Synthetic is a little hard (just like strip lashes) compared to the mink ones. I've never seen silk lashes so I won't know. Of course, the prices varies and ascends respectively. There are different colours as well! I couldn't believe this! There are red, black, brown, blue, green, purple and PINK! REALLY?!?! Talk about being extreme! hahah! Overall, Singles is very customizable! This is basically identical to top lashes except they are on your bottom lashes. Eyelash Canada is the FIRST AND ONLY company in Canada to offer BOTTOM Lash Extensions. Yvette developed this method herself and is exclusive to her business. So apparently this is rare and basically unheard of. I'm so happy to be able to try this out as well and share this with you!! 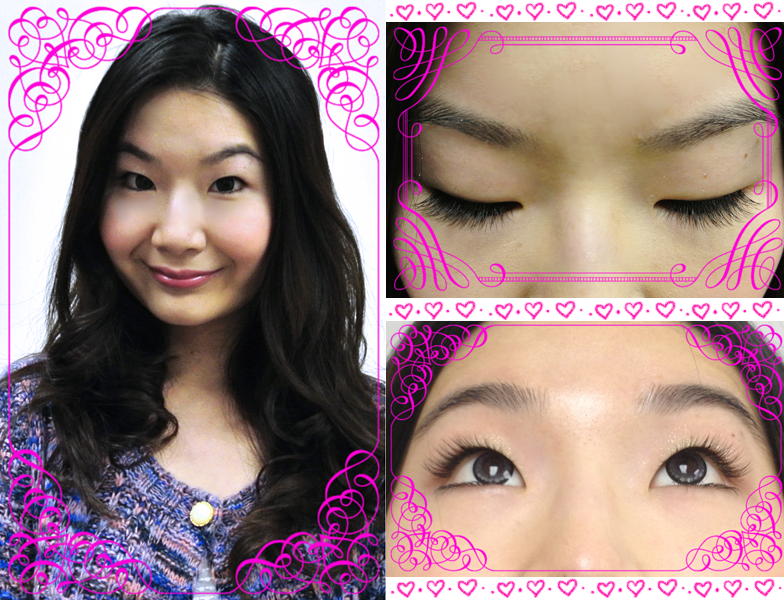 If you're interested in Semi and Strip eyelash extensions, you can find out what they are on Eyelash Canada's website! It has pictures to show you what they are all about! I would say that during the entire procedure, three things bothered me most. I think this is very personal and it may not bother you depending on your lifestyle and your adaptability etc. As you can see, the surgical tape is used to lift your lids, so the technician can see where they are attaching the eyelash extensions to your natural lashes. To me, anything that creates friction to my eyes and its surrounding area hurts a lot. The skin around my eyes is extremely sensitive so when she tapes it down and lifts it up - I was screaming in pain inside. I didn't want to scare Yvette and I know she is doing everything in her power to lessen the discomfort for me. Let me describe it to you, you know how a make up tip is to use a cotton swap to fix make up mistakes? Doing that to me, gets my skin red and I start tearing up because it hurts. It's just so annoying in a way! 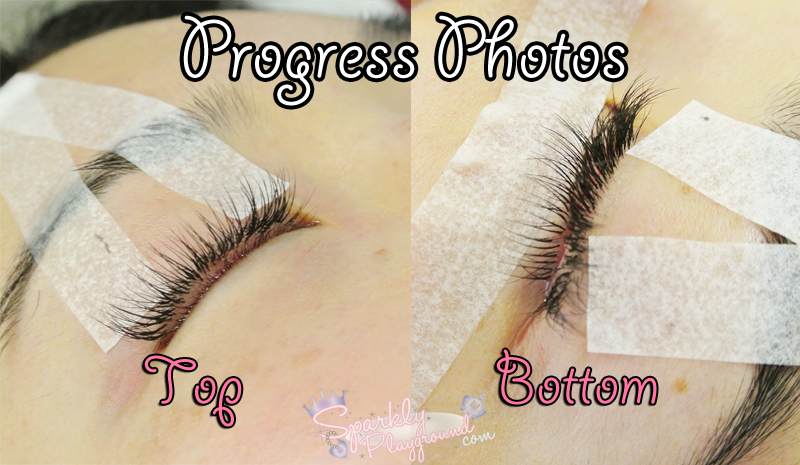 As you can see from the above photos, the surgical tape lifts your eyelids. So my eyes are not closed entirely and thus making my eyes extremely dry. When I finally opened my eyes to blink and look at myself in the mirror, I was tearing up like a mad woman it stings. *tears of joy* LOL! Again, something personal, I'm a dry eye kinda person so I was quite teary. ps, when I told Yvette that I feel discomfort, she kindly dropped an eye drop to lubricate and also close my eyelids. That felt so much better. Again because my eyes are not entirely closed, the glue in the air causes my eyes to tear a bit. (you know that feeling when you have an alcohol heavy toner?) I didn't have a tear drop out though. Yvette told me there's actually two adhesive she can use on me, of which one of them is not as stingy in the air. However that is not as long lasting. Both are the same price, so you're more than welcome to request it. She did mention that some customers have very sensitive eyes and will react more teary than me. So I'm the average client hehe! Other than these 3 things, which are all tied into the fact that I have sensitive eyes and skin, there is absolutely no pain involved. Make sure to state all your concerns with your technician before you begin. Yvette and her other technician, Ruby were both very patient and informative. I was one of those annoying people that doesn't stop asking questions and they didn't give me any attitude! HAHAHA! My eyelashes look extremely natural and pretty. They are nicely separated and has a beautiful shape flaring out. Yvette carefully placed the different lengths in to achieve this look. My boyfriend even said that he thinks my eyes look more friendly and innocent than before! Life with eyelash extensions is quite different because I need to be very careful not to mess it up within the first couple of days. Now, I'm definitely getting used to it. Many of my friends told me I have pretty lashes and it's pretty awesome! Thank you for reading and thank you to Yvette for inviting me to try it all! Video will come out once I finish editing the 3467254726 footages!